Lost And Found just completed their final concert. There one of my favorite groups. 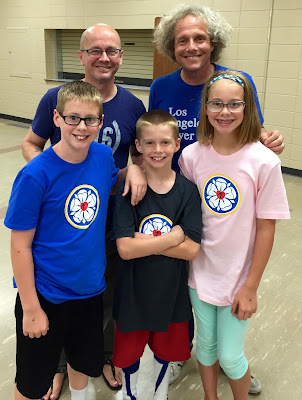 They were presented with the Tom Hunstad Award at the 2015 ELCA Youth Ministry Network Extravaganza. Here's what I had to say before announcing the award. Thanks, Michael Bridges and George Baum, for your 30 years of music ministry. #SteinAuf! At an Extravaganza about STORY, I’m compelled to tell a brief story about this year’s Tom Hunstad Award recipient. As a young confirmation student I was, perhaps, a tad over-zealous to claim the promises of baptism. In other words – I was stereotypical church nerd…which made rather me unpopular with my fellow classmates. In fact, they held me with such disdain, that they did some pretty awful things to me…some ugly, abusive, bullying things. Suddenly, I wasn’t so eager to claim my baptismal identity – I wasn’t even sure I wanted anything to do with God…and I certainly didn’t want to go to church. Unbeknowst to them, this year’s Tommy recipient was one of the few glimmers of hope in my life in those days…one of few true proclaimers of the gospel of love and grace and welcome that I so desperately needed…one of the few people who spoke to my heart and let me know that even though I felt like giving up on God, God wasn’t ever giving up on me. The recipients’ ministry of music is a juxtaposition of old and new…of acoustic and thrash…of silly and tender…but they are always honest. Their music is a genuine extension of who they are. Their words, their melodies, and their friendship have blessed the church…and as they prepare say farewell in this, their final year of touring, it is time for the youth ministry network to say “thank you” for entertaining and inspiring us for three decades. On behalf of the ELCA Youth Ministry Network’s board of director, it is my thrill to present the 2015 Tom Hunstad Award to George Baum & Michael Bridges – Lost And Found. It’s been a while since I’ve written something this self-indulgent. Consider yourself warned. I just saw CREED. Not the band. I haven't seen them since 2002. CREED is first installment of the Rocky movie franchise reboot. Here’s the trailer. I loved the Rocky movies growing up - and I still do. And by “Rocky movies” I mean the first four. Rocky V was an abomination. I didn’t see Rocky Balboa (VI) out of fear that I’d be disappointed again. My two sons love the Rocky movies. They watch them for the same reasons I watched them at their age…to get pumped up for no real reason. They may not be great movies, but they are great fun to watch. CREED is good...almost great. It’s probably the best film in the franchise since Rocky I. Not as fun or as testosteroney as some of the others. But quite good. I give it 7.5 out of 10. Fight Scenes — 10. Incredible. Some really great cinematography and choreography. I can’t say enough good things about the fight scenes. Training Sequences — 7. Very cool Not quite as epic as Rocky II (after Adrian wakes up from the coma) or Rocky IV (in Russia)…but they’re pretty impressive. Michael B. Jordan is legit. Love Interest — 5. There’s some decent complexity in the relationship between Adonis and Bianca. I also checked my phone a few times when I imagine the director wanted me to be interested in the love story. Pacing — 6. Like the first hour of Rocky I and II, CREED’s first hour was kinda boring. It’s a 2:15 movie that could easily be 1:45. Rocky’s Family — 9. They’re all dead or gone. That’s a good thing. I was ready to move on from all of the old characters. Villan — 4. Nothing menacing about the bad guy (Conlan) other than his temper. He’s kinda doughy - not physically imposing in any way. But he is from England and his trainer has some pretty great facial hair. Music — 7. Several nice callbacks to themes from I and II. Mixed in some hiphop and rap, which I liked. I was really hoping for a great new them song for this reboot (like “Eye of the Tiger” in III or “Hearts on Fire” in IV). I guess we’ll have to wait for the sequel. Stallone — 9. He’s perfect - funny in the ways Rocky is supposed to be funny. I like that he scaled back the “Rocky has brain damage” affect. Both the actor and the character have aged well. Bottom line: If you like Rocky movies, you should see CREED. Thanks for indulging me. Happy Advent to you and yours.